Recognition needs to be given to some people, that in all likelihood, go unnoticed year in and year out during the warm summer days and evenings. These are the people in the stylish red vests, the incomparable Guest Relations staff. And while I'm sure the entire group of Guest Relations Specialists do excellent work, even the sullen teenaged kid who mostly ignored us and left us to our own devices; Carolyn and Lynn stood head and shoulders above the rest and were phenomenal facilitators of fan enjoyment and deserve to be aknowledged. These ladies have a difficult job. They must balance time spent handing out roster cards (with fun and exciting, G-Force word searches on the reverse side) and player face masks. I was fortunate enough to secure a Greg Jennings mask that apparently my dog is deathly afraid of, the only reason I can think of is because Greg Jennings is a bad, bad, man. In addition to the distribution duties, Carolyn and Lynn are tasked with ushering fans to available seats. The skill set involved with this assignment is remarkably similar to Aaron Rodgers finding an open receiver in 2.5 seconds. Their job also includes confronting fans who are pretending to save seats, or are taking up more space than they need with snacks, cameras, binoculars, etc. Both sets of individuals are attempting to avoid eye contact like they are avoiding seeing Medusa. Carolyn and Lynn calmly, but firmly, address these fans and, more often than not, secure available seating for others looking for a spot to park themselves. I watched Carolyn and Lynn stack fans in the bleachers throughout practice, deftly moving people in and out and getting them seated or exited, all while limiting the obstruction of other fans’ viewing. Needless to say, it was impressive. 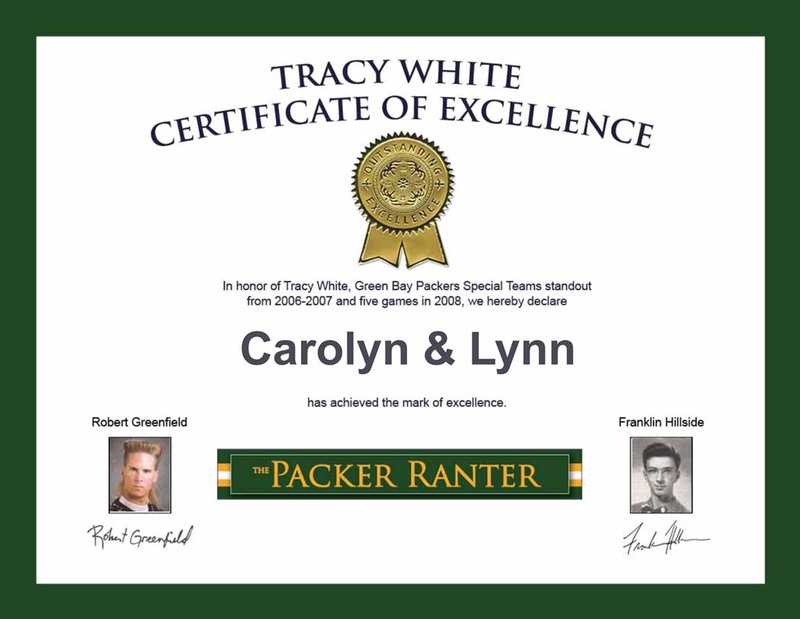 Upon leaving, I thanked both women, but Carol was busy assisting an elderly gentlemen and Lynn was directing foot traffic to allow a mother with a stroller to leave Nitschke Field. 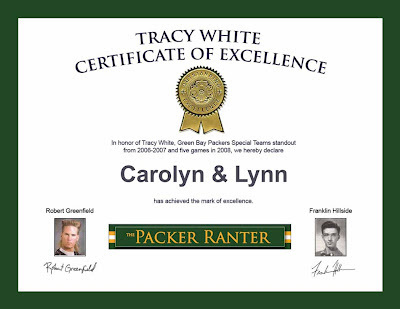 I’m doubtful that either will see this, but I thought I would bestow upon them The Ranter’s highest honor, The Tracy White Certificate of Excellence. Thank you, ladies. You deserve it. My dog hates my Greg Jennings stick head too.